I have seen a few different versions of a skillet seared-then-baked chicken with sun dried tomatoes floating around on Pinterest & Instagram (like this one from "Diethood" and this one from "Cafe Delites"). All have looked SO drool-worthy, I couldn't wait to give it a try with my own spin! This one is completely Paleo approved, and 100% Whole30 compliant. Dairy-free, so the "cream" sauce comes from thick & creamy coconut milk. Grain-free, with the option to eat the dish all on its own, or over whatever veggie you like. We tried this scooped & served one way over green beans (fresh & yummy) and another over steamed Yukon gold potatoes (rich & hearty). No matter which way you take this~ you will NOT be disappointed! There's something about sun-dried tomatoes that gives a sauce the most decadent, rich, and savory flavor. Combined with some extra veggies- chopped broccoli & sliced mushroom, there's a balance in this dish I just love. And that crispy, golden brown chicken?! Whoever made skinless cuts of chicken a "thing" should be fired, just sayin'. 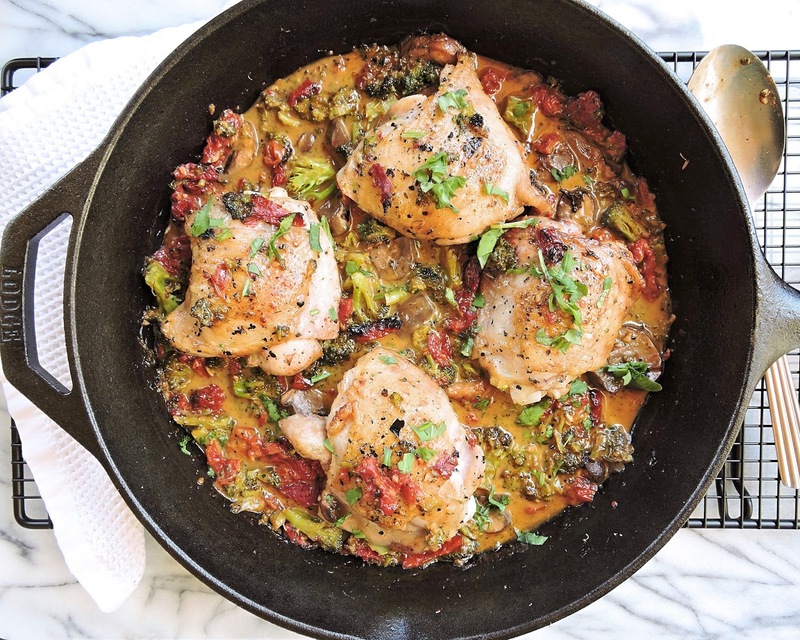 I hope you love this rich, delicious chicken skillet meal as much as we have. Enjoy! Preheat the oven to 400ºF. Pat the chicken thighs dry, and season with salt & pepper. In a large oven safe skillet, melt 2 tablespoons of the ghee over medium-high. Add the chicken, skin side down. Cook each side until golden, about 2 to 3 minutes per side (don't worry about cooking them through). 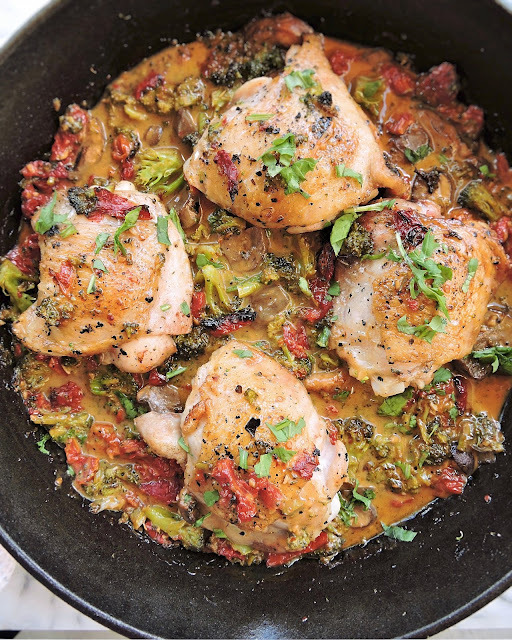 Remove the chicken, setting it aside on a plate. Melt another tablespoon of ghee in the skillet. Add the garlic, red pepper flakes, sliced mushrooms, and chopped broccoli, and cook for 1 to 2 minutes. 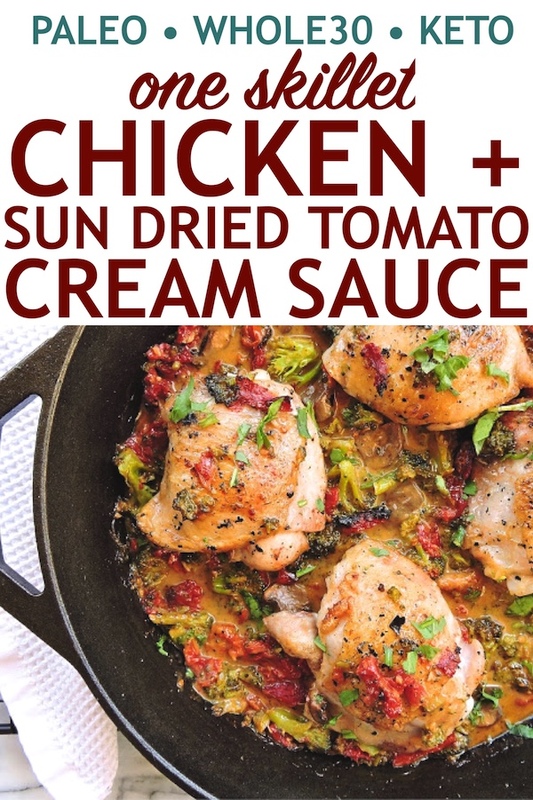 Stir in the chicken broth, coconut milk, sun dried tomatoes, and dried herbs and spices. Bring the sauce to a low boil, then reduce to a simmer. Cook until the sauce begins to thicken, about 3 to 5 minutes. Add the chicken back to the skillet. 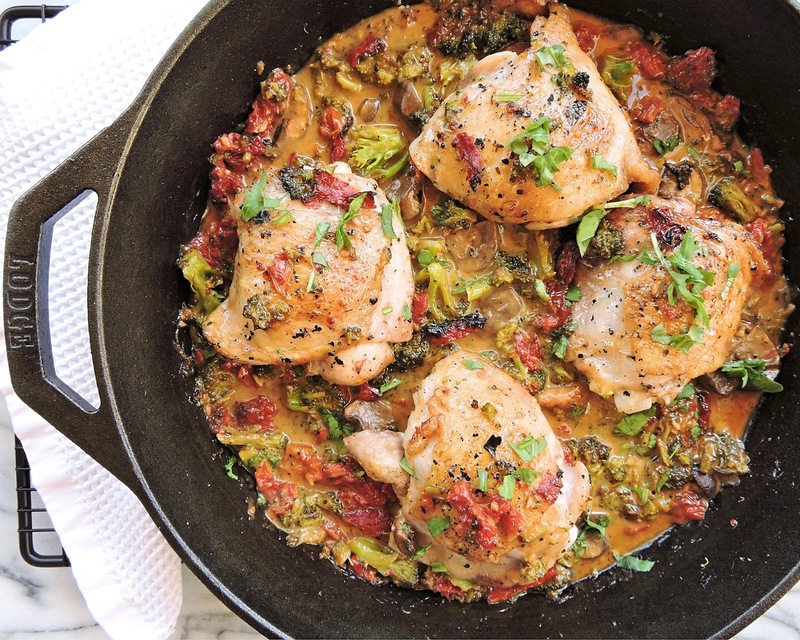 Place the entire skillet in the oven and bake until the chicken is cooked through, about 25 minutes. Serve hot, topped with chopped fresh parsley, and enjoy! This tastes just as good- if not better- left over, and was super yummy over a starchy veggie like steamed baby gold potatoes! Great recipe! 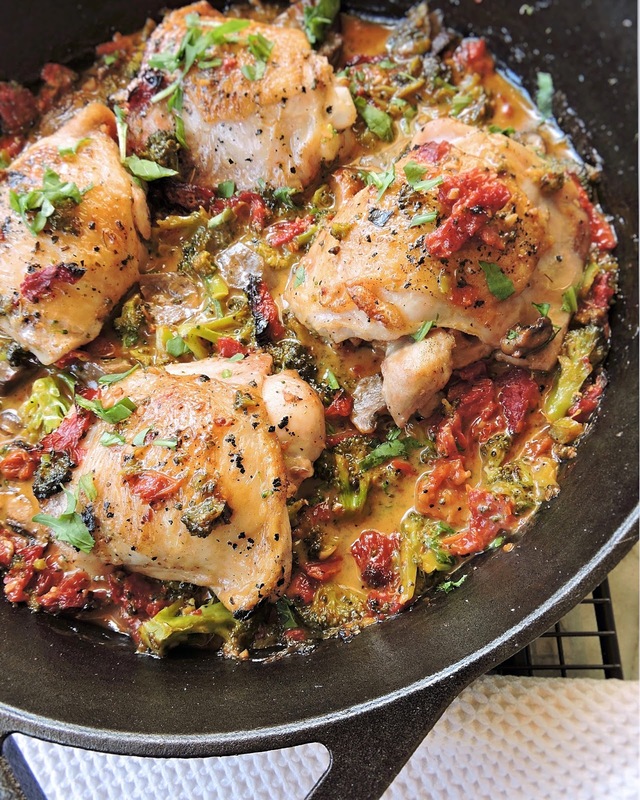 You can also finish this on the stove top if you don't have access to an oven. Really, really good! The sauce could be used on just about anything. Definitely a keeper recipe! Very glad it’s also Whole30 compliant! This is my favourite recipe. I am trying to do a keto diet and I can't find any nutrion info. Please post! It was sensational! I just loved it! Wish I could post a pic here! Cheers!